Epidendrum orchids (Epidendrum spp. ), also known as reed-stem epidendrums, are one of the easiest orchids to grow. They bloom readily in various shades of orange, pink, purple, red, yellow and white. While epidendrums can be grown outdoors in U.S. Department of Agriculture plant hardiness zones 9 to 11, they are usually grown indoors. Place epidendrum orchids in front of a south-, west- or east-facing window where it will get at least a few hours of direct sunlight each day. Insufficient light is the most likely problem when an epidendrum does not bloom. It will also cause the orchid to grow leggy stems with long sections of stem between the leaves. Epidendrums are not fussy about room temperature. They are fine as long as it stays between 60 and 90 degrees Fahrenheit. If it is not possible to provide direct sunlight, put the epidendrum in the brightest area possible and provide artificial light. Use a fluorescent light fixture with three to four bulbs. One or two of the bulbs should be special high-intensity bulbs designed for plants. The other bulbs can be cool-white fluorescents. Set the light 6 inches above the orchid and leave it on for 16 hours each day. For convenience, plug the light fixture into an automatic timer. Set the timer to turn the light on in the morning when the sun comes up and off 16 hours later. Fertilize epidendrum orchids with water-soluble houseplant fertilizer every two weeks during the spring and summer. Use fertilizer with a 10-5-10 or 20-10-20 ratio. This type of fertilizer is commonly mixed with water at a rate of ½ teaspoon per quart of water, but this varies so follow label directions. Water the epidendrum first, pouring the water evenly over the growing medium until it drains from the bottom, then pour the fertilizer over the growing medium. Water epidendrums when the growing medium begins to dry, usually once a week. During the fall and winter, allow the growing medium to become slightly dry before watering and reduce fertilizer applications to once each month. The growing medium for epidendrum orchids must drain quickly. A commercial potting medium designed specifically for orchids is usually good. A mixture of fine- and medium-grade fir bark that contains 15 to 20 percent perlite works well. Coconut chips may also be included in the mix. The potting medium should be replaced every 12 to 18 months as it breaks down. Epidendrum orchids are susceptible to Rhizoctonia root fungus, tobacco mosaic virus and colorbreak virus. Rhizoctonia causes epidendrum leaves to develop a red tint and shrivel. If the epidendrum develops this root fungus, treat it with a soil-drench fungicide that contains a benomyl-related chemical like thiophanate-methyl. A common dilution rate is 0.16 to 0.24 ounce per gallon of water, but this varies so follow label directions. Pour the solution evenly over the potting medium until it drains from the bottom. Rhizoctonia root fungus can be prevented by changing the potting medium once each year. Tobacco mosaic virus causes green to black streaks and checker patterns on the leaves. 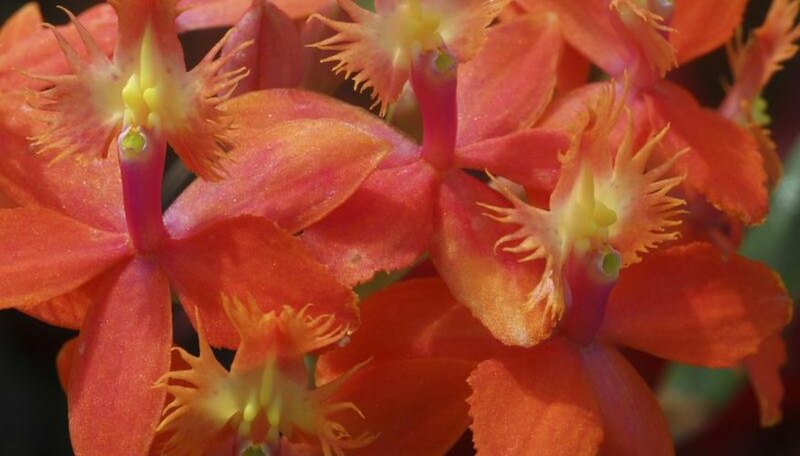 Wash your hands thoroughly with soap and water before handling an epidendrum orchid if you smoke. Colorbreak virus causes streaks on the flowers. There is no cure for these two viruses. If an orchid develops either, throw it away immediately to prevent the spread of the disease to nearby plants. Aphids, mealybugs and scale insects can become a problem for epidendrum orchids. Aphids are small, soft-bodied insects. Mealybugs are small, oval, slow-moving or immobile insects that are usually white or off-white and have a mealy appearance. Scales are small, flat, immobile insects that are usually tan; scales may be carried to the orchid by ants which are attracted to the nectar in the flowers. All of these insects are commonly found on the undersides of leaves but may also be found on the tops and stems. They pierce the orchid’s leaves and feed on the plant juices. A clear, sticky liquid called honeydew is excreted on the leaves by these insects. Insecticidal soap can be used to kill these insects. It is sold already mixed and ready to use or in concentrate form. The concentrate is usually mixed with water at a rate of 2.5 ounces to 1 gallon of water. Shake it up to mix it thoroughly, pour it into a spray bottle and spray the orchid until the mixture begins to drip from the leaves. Spray the tops and bottoms of the leaves as well as the stems. Repeat every two days for persistent aphids or every seven days for other insects for a total of three applications. The soap should be rinsed off after an hour or two. It will only kill the insects it initially comes in contact with and, if left on the leaves, could interfere with the orchid’s ability to absorb light.